Screenshots of “Hijacked” have been released in the latest Operation Absolute trailer. Operation Absolute is the first major update to Call of Duty Black Ops 4. The update includes DLC, Blackout map changes and an all new specialist “Zero”. In the trailer you can see a player dropping into a game on Blackout. 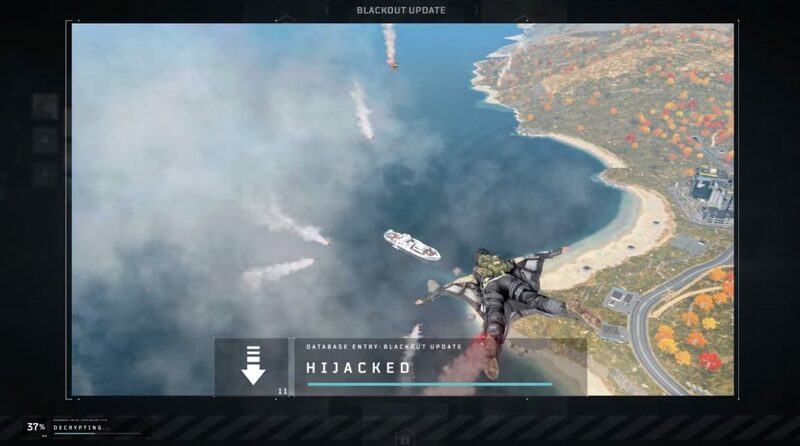 On the way down you will notice the boat, famously known as “Hijacked” off the coast on the West side of the Blackout map. Hijacked is a popular multiplayer map from Black Ops 2. The map has been remade in Black Ops 3 and appears to now be a part of Black Ops 4 Blackout. It is unclear if the boat is permanently positioned there of it it will move around the map. Operation Absolute is set to release first on Playstation 4 on December 11, 2018. PC and Xbox One are expected to get the release one week later on December 18, 2018. You can view the teaser trailer for Operation Absolute below.